In a large saucepan, add sugar, butter, salt, and heavy cream. Heat over medium high and bring to a boil, stirring constantly. Once boiling, continue to stir and boil for a full 4 minutes (a good rolling boil). Remove from heat. To a large mixing bowl, add white chocolate morsels, marshmallow cream and pudding mix. Pour hot sugar mixture over this. Using an electric mixer, beat until chocolate is melted and creamy (about 1 minute). Fold in dried cherries and pineapple. Pour into an 8-inch square baking dish that is lined with parchment paper. Refrigerate for 3 hours, or overnight. Cut into 64 bite sized pieces. In a small microwave safe dish, melt white chocolate morsels for 30 seconds, stir and heat an additional 30 seconds until creamy. 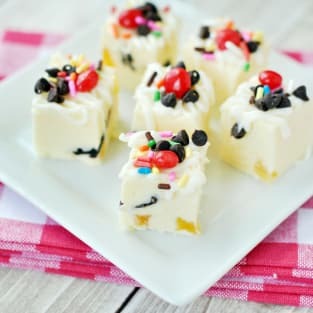 Drizzle over fudge pieces and add sprinkles and mini chocolate chips immediately. Store in an airtight container in the refrigerator for up to two weeks. ENJOY!